"If it works anyone can do this exactly as we have done." No, it's not free, nor is it loaded right onto your iTunes, but the second solo album from Thom Yorke is still something of a surprise. 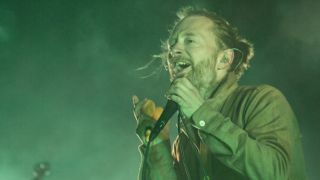 The Radiohead/Atoms For Peace singer announced today in joint statement with producer Nigel Godrich, that the eight-song record, Tomorrow's Modern Boxes, is now available via BitTorrent in what is called the "first ever paygated torrent in history." The new Torrent files have a pay gate to access a bundle of files. The files can be anything, but in this case is an 'album'. The torrent mechanism does not require any server uploading or hosting costs or 'cloud' malarkey. Oh yes and it's called Tomorrow's Modern Boxes. The album can be downloaded as a bundle, which includes a video for Brain In A Bottle, at BitTorrent for $6 US (or £3.68 GBP).